Pug problems can be on the mind of any current or future Pug owner. Just take a quick look through this site and you will see that we cover them all. From health to behavior, from diet to aging, we have information that will be helpful and aimed at getting you the answers you need. We love Pugs and never get tired of researching this lovable little breed and discussing the needs of the owners and this adorable breed of dog. 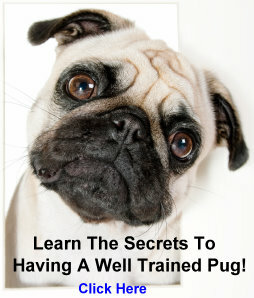 Pug problems for many owners mean a health condition. This can range from a skin condition such as fleas or ticks to a more serious problem like hip dysplaisia. Some of the problems are more common in a Pug than other dogs. Pugs are unique in many ways. They are prone to breathing problems because of their facial structure and, because of this, do not tolerate heat particularly well. Be careful in the hot weather to take it easy when you take your Pug out for a walk. You have to remember to take it easy because your Pug will not. Do not let your Pug stay in the direct sun and make sure there is plenty of water. The bone structure of the Pug can lead to certain conditions as well. This is true with any pure bred dog. Remember, the things that make this breed of dog distinctive also becomes a weakness because these conditions are perpetuated because of the nature of the breeding process. We do not want to scare you off by any means from getting a Pug. These dogs are adorable. Make sure you go to a reputable breeder who is in this for the love of the breed and not the money. Better still, go to a Pug Rescue group who can lead you to a wonderful little Pug who needs a loving owner. In addition to hip dysplasia, a Pug can develop a dislocation of the knee cap which is a condition called patellar luxation. This usually shows up in younger dogs and can be corrected although, many times, this requires surgery. Please do not be scared off from this information. All dogs are prone to conditions like these just as humans are. Your veterinarian is an expert and should be consulted on all of these subjects. Remember, when you search for veterinary care, make sure you ask if the particular vet you are considering has experience with Pugs. Two of the most distinctive features of this dog are the eyes and the wrinkled face. The eyes of the Pug are very prominent so it probably comes as no surprise that one of the most frequent of all Pug problems is an injury to they eye. You want to very careful not to have anything sharp sticking out at his level and, if you have children, tell them to be gentle when they are playing with their little friend and do not let them touch the face of the Pug. 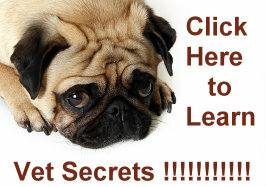 Pugs are prone to any of the skin problems of any other dog like fleas, ticks and mites. Proper skin care will help you avoid any of these common Pug problems. Careful grooming can help your Pug stay healthy. Part of this is proper dental care. As you probably noticed a Pug has a fairly small head but when you look into his mouth there is no shortage of teeth. Pugs do, indeed, have slightly more dental problems than the average dog. For many owners behavior is one of the most common complaints in the list of Pug problems. On this topic we like to think that the Pug gets an unfair reputation. They are not any more stubborn or difficult to train than any other breed. They are, however, very cute and subject to spoiling than most breeds. It can be difficult to say no to that hopeful little face when a Pug wants something. Many owners admit that they are owned by their Pug. But it definitely does not have to be that way. Pugs are very intelligent and very trainable. They like nothing better than pleasing their owners. When you have those things going for you there should be no problem in training your Pug. The aging or senior Pug has a special set of problems just as any dog or other animal would. Last time we checked humans have those problems too. Senior Pug problems can be lessened by taking extra steps to make your Pug’s life as comfortable as possible. Moving his bed to a warmer spot, shortening his walk but letting him walk more frequently and lessening the amount of food to control his weight can be things you do for the comfort of your aging friend. Please make sure that you browse through this site. We cover all of these topics in great detail and constantly update the information.